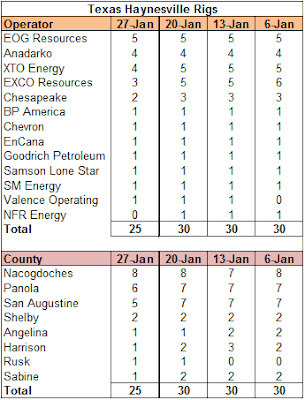 The Haynesville Shale rig count dropped another four rigs, leaving 79 working rigs in the play. Louisiana was up one to 54, while Texas was down five to 25. I was out of town at the end of last week and didn't have the chance to report that the U.S. rig count was unchanged at 2,008. While the total didn't change, oil rigs were up two to 1,225, gas rigs were down three to 777 and miscellaneous rigs were unchanged at six. By type, horizontal rigs were up two to 1,185, vertical rigs were down 13 to 606 and directional rigs were up 11 to 217. The Wall Street Journal reported over the weekend that private equity company Apollo Global Management is leading a group that is at the front of the line negotiating to buy the E&P unit of El Paso from Kinder Morgan once it completes the acquisition of El Paso. If this happens it is a rare case where another PE company beats KKR to a domestic energy deal! The price tag would be around $7 billion and fund about a third of the $21.1 Kinder will pay for EP. Kinder is considering a sale of the E&P unit as a single entity or breaking it up and selling the pieces. Often the sum is greater than the whole - especially if a buyer is willing to pay a premium for a particular asset - but it is easier to sell the package as a single entity. Stay tuned. With Mitt Romney's history in the PE industry making front page news, PE is getting more attention, but I would argue that it is still not well understood. I've worked in the industry for a number of years and the one thing I can tell you is that EP would be bought to be resold. Period. I'm not sure how that would impact operations at EP, but it means that a PE owner is not going to sit around twiddling its thumbs waiting for gas prices to rise. It will work hard to "create value." What that overused term means in this case is that they will make the company look as valuable as possible - in this case, build reserves, cut costs through efficiencies (good, bad or otherwise) and boost production. But what it also means is that the company likely would be sold or IPO'd in the next three to five years. Sometimes that means slapping a lot of lipstick on the proverbial pig, and sometimes that means making something out of nothing. Which will it be? Only time will tell. 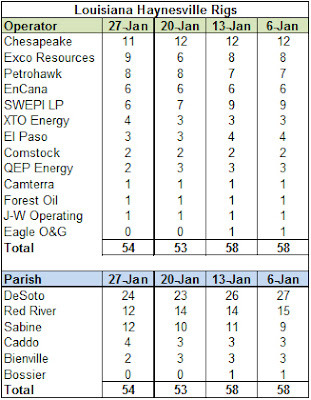 So, I hear that Encana is ceasing much of its operations in the Haynesville Shale by mid-February and keeping a couple of rigs working in the play for the rest of the year. 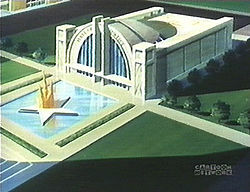 The company has not confirmed this, therefore it is officially classified as a rumor, so take it with a grain of salt. In its latest investment presentation, Encana doesn't foreshadow any big moves in the Haynesville. Instead it features the play fairly prominently in its presentation. Of course, I'm just reading it and have not had the benefit of attending the actual presentation, so they might be saying it's a piece of you know what. But later in the presentation, management touts that it is running 21 rigs in the play through the company's JV with Shell (SWEPI). I'm not sure where the truth lies, but it seems that most of the E&Ps are coming out with cutbacks in dry gas activity, so it would not be a surprise. Encana seems intensely focused on developing oil and NG liquids resources along with completing the Kitimat LNG facility in western Canada, so I wouldn't blame them for heading towards the sidelines in the Haynesville to sit things out for a little while. 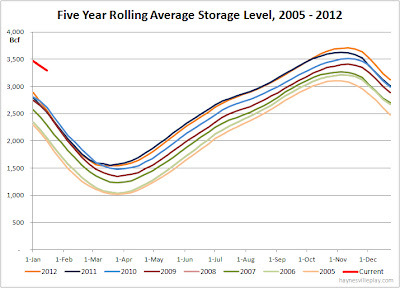 The weekly storage level finally took a big dip this week, after a month of badly lagging historical averages. Last week saw a net withdrawal of 192 Bcf, bringing the level to 3.098 Tcf. The withdrawal was 4% greater than last year (184 Bcf) and 11% better than the five year average (-173 Bcf). Given the narrow "win," the storage levels still have a long, long way to go to catch up, something that looks impossible this year. The current storage level is 20.7% above last year (2.751 Tcf) and 21.4% above the five year average (2.551 Tcf). Temperatures last week were slightly above average, 1.1 degrees above the 30 year average and 1.0 degrees warmer than last year, so it's a good thing that the weekly withdrawal slightly beat prior averages. In response to record low natural gas prices, Chesapeake Energy is altering its operating strategy to cut back its gas operations. First, it will slash gas rig counts. Chesapeake currently operates 47 gas rigs (down from an average of 75 in 2011), and the reduction to 24 rigs should happen in the second quarter. The Haynesville rig count should drop to six at that point, with the remainder being split between the Barnett (6) and Marcellus (12) Shales. Dropping rigs leads to lower production in the future, but to get a more immediate impact, the company will postpone some completions and hold off on connecting completed wells to pipelines. To make the most immediate impact, Chesapeake will curtail production by 0.5 Bcf/day (currently 6.3 Bcf/day, gross) and might decide to up that curtailment to 1.0 Bcf/day. Most of this curtailment will take place in the Haynesville and Barnett, so the company expects to report production declines in both plays this year. As one would expect, the savings will be channeled to the company's oil and liquids production, blah, blah, blah. You can fill in the rest of that. Chesapeake also announced that it would spend only $1.4 (net) on undeveloped leasehold expenditures. 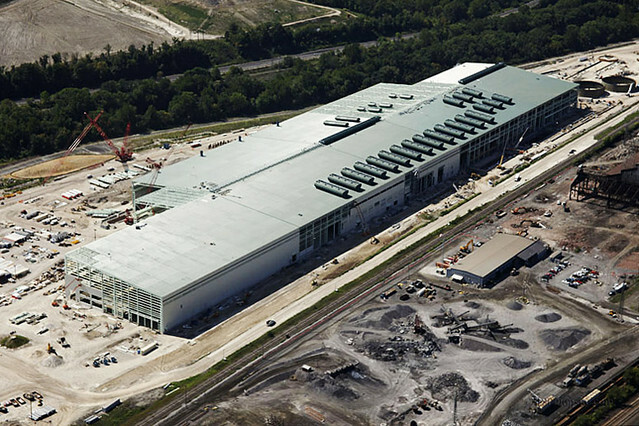 It spent $3.4 billion in 2011 and $5.8 billion in 2010 on leases, so this is a big drop. But perhaps the biggest change is that all of the money will be spent in existing plays, so don't look for the next big shale play to come from CHK in 2012. At least that's what they say now. While this is a hard pill to swallow for folks in the Haynesville, at least it is action to address the overflow gas supply situation that will hold prices down for the foreseeable future. Unfortunately, redirecting capital to liquids production will lead to the production of an unknown quantity of associated gas, so I'm not sure what the net impact to gas production will be from these actions other than less money flowing into LA and TX. 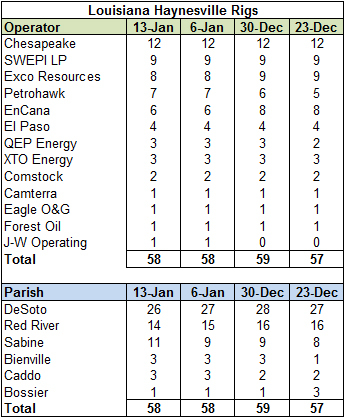 The weekly Haynesville Shale rig count decreased by five to 83. Louisiana was down five to 53, while Texas held at 30. It's not exactly the next superhero residing in the Hall of Justice, but for gas drillers, the new "super fracking" techniques being developed by the big oilfield services companies like Schlumberger, Baker Hughes and Halliburton are something to cheer about. New technologies can supposedly save producers millions in well costs while enabling them to produce more gas. While some fracking opponents are not happy about these nascent techniques, they don't seem to be anything different than regular fracking outside of what goes on thousands of feet underground. But one potential downside is that it might make gas production economic for producers at even cheaper prices. Whoopee! Just what we need: more cheap gas. This morning, my wife was complaining about our unusually warm winter, "I've got all these new sweaters that I want to wear but can't." Awesome. So the warm weather is destroying the price of natural gas and now we've got a trove of new unworn sweaters clogging the closet - a lose-lose situation if ever there were one. The weekly Baker Hughes U.S. rig count showed a 21 rig increase, bringing the number of working rigs to 2,008. Oil rigs increased by 32 to 1,123, gas rigs declined by 11 to 780 and miscellaneous rigs held at five. By type, horizontal rigs were up 22 to 1,183, vertical rigs were up six to 619 and directional rigs were down seven to 206. 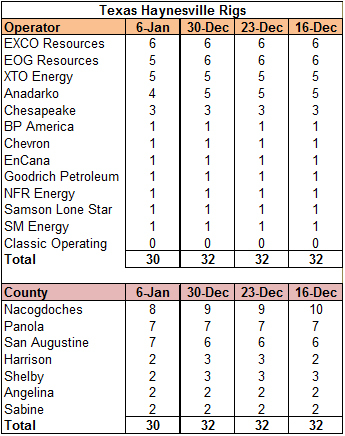 Currently, there are 443 fewer gas rigs than oil rigs. This is a pretty remarkable development considering that four years ago there were 1,134 more gas rigs than oil rigs, a net swing of 1,577 rigs. During that time the rig count has increased by only 234 rigs. Three and a half years ago when the total rig count was almost equal to today's, the disparity was even greater with 1,199 more gas rigs than oil rigs working. My, how things have changed! 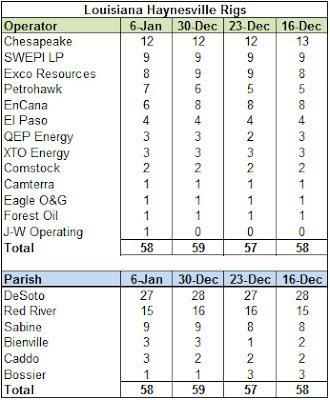 The Louisiana DNR finally caught up on its lagging completions reporting in a big way with 58 new completions and a bunch of completions I've already reported that needed some back-fill. I've broken up the completions data into three groups of parishes as you will see from the posts below as a service to anyone who actually reads them. The spreadsheets and maps are updated. It's been hard to watch natural gas prices plummet over the past few weeks as storage levels have remained stubbornly high. A reader makes a good point in a comment today that it's especially difficult to watch this story when we are comparing current data to averages that are themselves bloated. Because the five year average that is used as a standard comparison is a rolling average of the previous five years, the record levels of storage for the past three years have served to skew that average upwards making it a less useful measure. As the table below shows, the current maximum average storage level for the past five years was 3.705 Tcf. Back in 2005, it maxed out at 3.106 Tcf, a 599 Bcf difference from today. 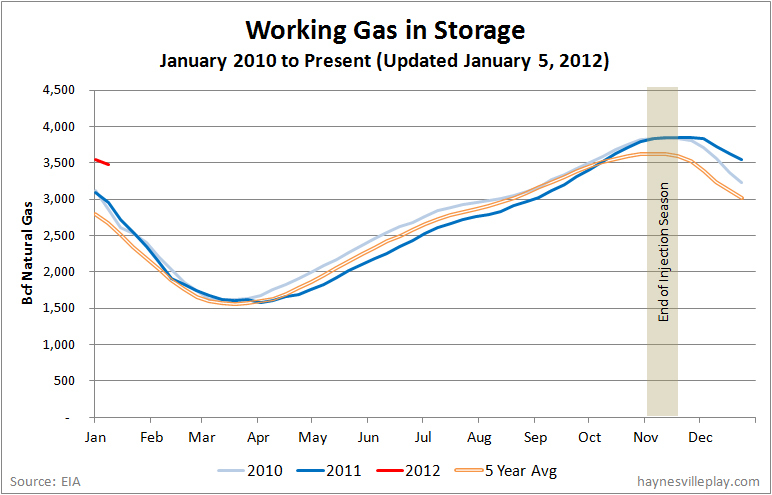 Of course, since then there has been new storage added, but the trend is clear. To make your stomach churn, the current storage level is 3.29 Tcf, 184 Bcf higher than the maximum average from 2005, and we are eight weeks into the withdrawal season that got off to a late start. If you're like me, you need to see it as a picture for it to sink in. Here it is, grab your barf bags, put your head between your knees and prepare for a very rough ride. The weekly EIA working gas in storage report showed an 87 Bcf decrease to 3.29 Tcf, which is WAY TOO HIGH. The weekly injection was 62% less than last year (-228 Bcf) and 46% below the five year average (-162 Bcf). The current level is 19.6% above last year and 20.8% above the five year average. 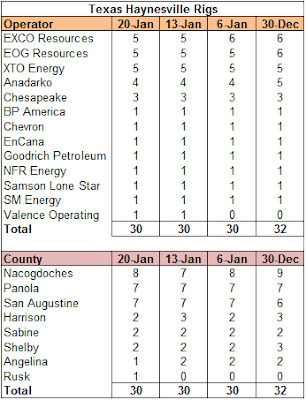 Not much new Haynesville Shale permit activity in Texas for the past month. Running out of ideas or just a slow filing time? The Haynesville Shale rig count was unchanged at 88. Louisiana held at 58 and Texas held at 30. The weekly Baker Hughes rig count showed a 20 rig decrease, bringing the number of working rigs to 1,987. 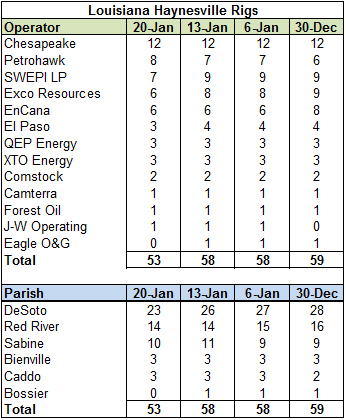 Oil rigs held at 1,191, while gas rigs were down 20 to 791 and miscellaneous rigs held at five. By type, horizontal rigs were up one to 1,161, vertical rigs were down 18 to 613 and directional rigs were down three to 213. The number of gas rigs is at its lowest point since January 2010, but it is still above its lowest recent level of 665 in June 2009. While we definitely need to see a reduction in gas rigs to see any upward bump in gas prices, I would argue (actually, have been arguing) that a drop in gas rig count will not directly correlate with a reduction in gas supply and therefore an improvement in prices. I updated the Mid-Bossier Shale completions list and map today. I added a few wells that I noticed in recent days. When looking at this data, remember the caveat that because there is no separate classification for Mid-Bossier wells, all of the data on this list is gleaned from my research/estimation as well as from investor presentations and hearsay. Interestingly, much of the data from investor presentations is about competitors' Mid-Bossier locations. 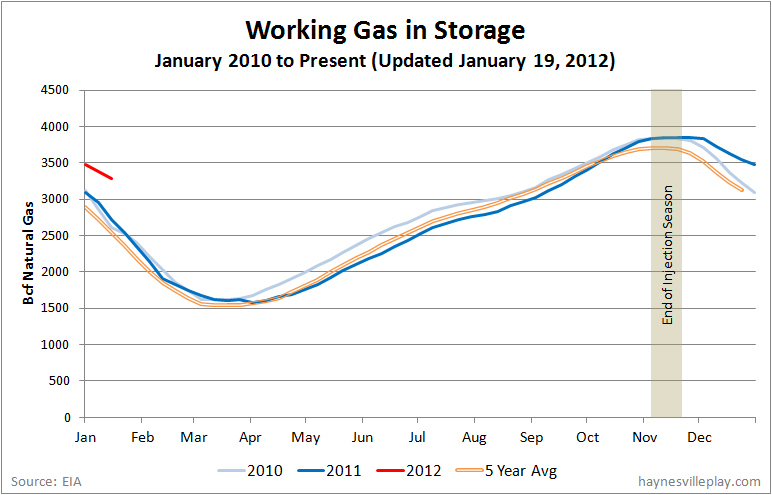 The weekly EIA working gas in storage report showed a 95 Bcf decrease, bringing the level of gas in storage down to 3.377 Tcf. The weekly withdrawal was considerably lower than last year (-31%) and the five year average (-26%), but it is not as terrible as it has been for the past couple of weeks (that's looking really hard for a bright side). But with the weak withdrawal, the current storage level continues to fall behind last year (+13.4%) and the five year average (+17.0%). With each successive week of not beating prior years, it becomes harder and harder to get storage down to a level to allow for a normal injection season in summer and fall. At the current rate of withdrawal, unless there is a major cold snap or an extra long winter that leads to huge consumption levels, it looks like we will see storage max out in late fall. If that happens look for production curtailments. When the tank is full, it's full. As in weeks before, the culprit for the weak storage numbers was warm temperatures. 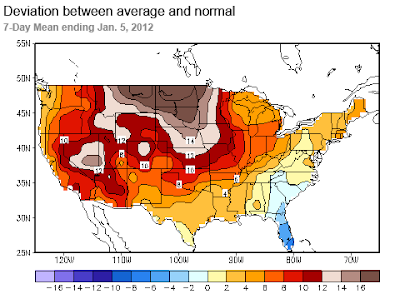 Last week, temperatures averaged 4.6 degrees above last year and 4.6 degrees above the 30 year norm. For the past decade, the owners of the proposed Crown Landing LNG project bitterly fought opponents to the project for the right to build an LNG import facility on the banks of Delaware River in New Jersey. One case ended up in the Supreme Court. But after all that work and all that fighting, it was low natural gas prices and abundant domestic gas supplies that finally killed the Crown Landing project. But the DNR is starting to catch up on some of its backlog from not having stayed current with reporting new completions for the past several weeks. I've back-filled some of the data for about 45 previously reported completions on the spreadsheets but am waiting another week to update the maps so they won't have any data gaps. 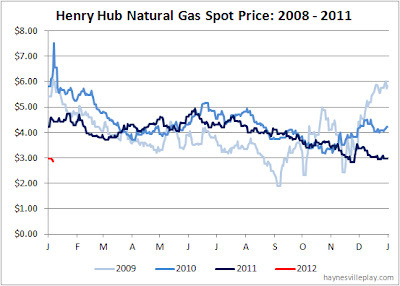 I'm bullish on the long-term future of natural gas but less so on its price. Chesapeake Energy, on the other hand, is dispensing the Kool-Aid, urging us to be bullish on both. (Mmmm, I'll take cherry.) In its most recent investor presentation, the company lays out the argument for a recovery of natural gas prices in the intermediate and long-term. The presentation makes many of the same arguments I've made in these pages, but it leads with one I don't quite buy. CHK suggests that once producers fulfill their requirements to hold leases and move towards liquids and oil in their production base they will have little reason to go back and drill cheap gas, and therefore prices will rise. That makes sense on the surface, but I don't think it holds up to scrutiny for several reasons. "Surging prices for oil and gas shales, in at least one case rising 10-fold in five weeks, are raising concern of a bubble as valuations of drilling acreage approach the peak set before the collapse of Lehman Brothers Holdings Inc."
The only thing missing from the sentence was "Enron" or "dot.bomb!" These days, everyone is looking for the next big bubble since they seem to be popping around three per decade. At that pace, the next one should be due in a year or two. While there may be a bubble in shale drilling, I think it has more to do with natural gas over-production than the valuation of oil and gas shales. And I'm definitely less worried about foreign companies paying U.S. producers too much money for acreage and shale expertise. Actually, foreigners overpaying for acreage sounds more like an economic development plan (leading to jobs!!!) than a bubble popping. True, foreign joint ventures accelerate drilling, which leads to over-production, but the article is more panicked about valuations. But as far as I'm concerned, the big foreign players can keep tripping over themselves to pour billions of dollars into U.S. businesses. 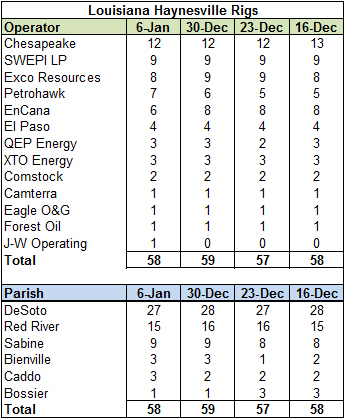 The Haynesville Shale rig count dropped by three last week, bringing the number of working rigs to 88. The count was down one in Louisiana to 58 and down two in Texas to 30. I'm finally losing faith in the idea that high natural gas supply and continued low prices will create some sort of fiscal austerity that will cause producers to lay down rigs en masse. Cold winters for the past two years artificially lowered supply to give the producers a break, but all that did was give them breathing room to count their blessings without breaking stride. This winter, if you give the producers a break (a brutal cold snap that craters supply levels), it's pretty clear that they will treat it as an excuse for business as usual. But if there is no such break this year and we have a warm winter, what happens? I would argue that their behavior will not change dramatically. 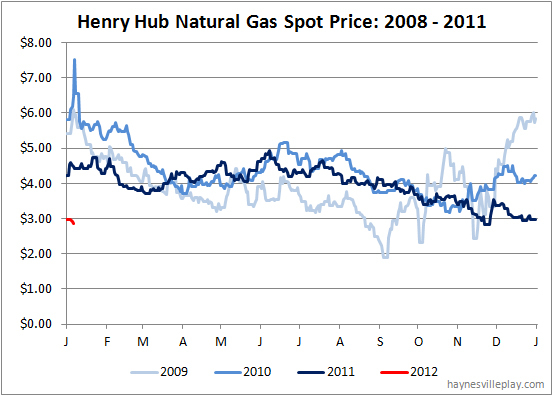 This new year started with a thud for natural gas prices, as the red line on the chart below illustrates. Considerably worse than past (unimpressive) years. Given the market conditions and the current high level of storage, don't look for the January spike in prices we've seen in past years. 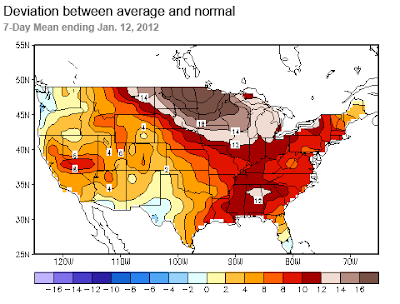 I hate to say it, but gas fans need to pray for a new (albeit temporary) Ice Age. Or at least a few big, well placed cold snaps. 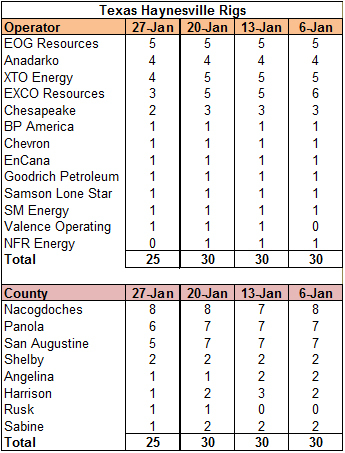 The weekly Baker Hughes rig count held at 2,007 for the week. 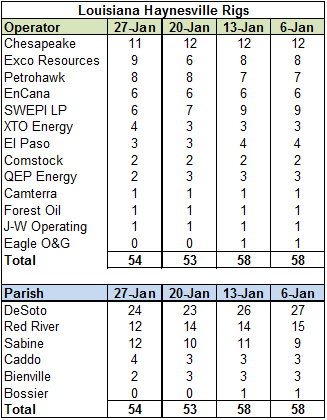 Oil rigs were down two to 1,191, gas rigs were up two to 811 and miscellaneous rigs were unchanged at five. 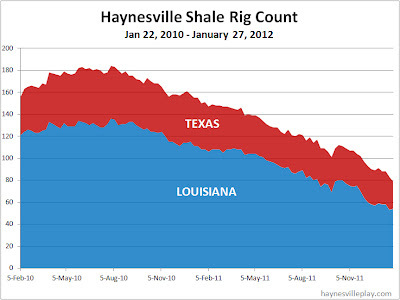 By type, horizontal rigs were down seven to 1,160, vertical rigs were up six to 631 and directional rigs were up one to 216. Earlier this week, Devon Energy announced a big joint venture deal with China Petrochemical Corp. (a.k.a. Sinopec) covering five emerging U.S. basins. Sinopec will pay Devon $2.5 billion for a one-third share of Devon's 1.2 million acres in the Tuscaloosa Marine Shale (LA-MS), Niobrara (WY), Mississippian (OK), Ohio Utica Shale (OH) and the Michigan Basin (MI). Sinopec will pay $900 million cash upfront and $1.6 billion of carried drilling costs over the next several years. Devon's deal is yet another example of a multi-national energy giant kneeling at the altar of shale gas in the U.S. Last week, Total and Chesapeake signed their JV deal for the Utica Shale and last month SandRidge Energy and Spain's Repsol YPF agreed on a $1 billion JV for SandRidge's acreage in the Mississippian play. One big difference with Devon's deal is that the EIA estimates that China has the largest technically recoverable shale gas reserves in the world. The Chinese are here to learn so they can exploit their own resources. China's CNOOC already made a shale deal with Chesapeake last year. This is a double-edged sword for U.S. shale. On one hand, China represents one of the largest export markets for natural gas (and it sure would be nice to see them burn less coal!) but at the same time it hopes to leverage U.S. expertise to produce its own gas to supply much of its demand in the long-term. 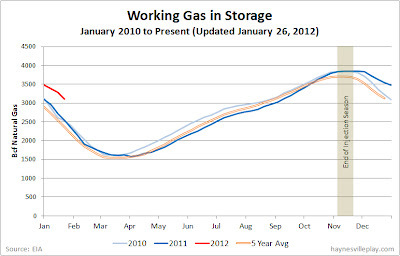 The EIA working gas in storage report showed yet another disappointing net withdrawal this week. The storage level only dropped 76 Bcf to 3.472 Tcf. The weekly withdrawal was 44% below last year (-135 Bcf) and 28% below the five year average (-106 Bcf). As a result, the current storage level is 11.4% (+356 Bcf) higher than last year and 15.2% (458 Bcf) above the five year average. This is a serious problem for natural gas. I don't necessarily expect gas prices to plummet in the very short term, as utilities will be snapping up cheap gas to use instead of coal, but with the current level so high, it will be very difficult to pare it back before the injection season begins again in a few months. So, not only is natural gas facing an uphill climb against a slow economy, now it has to contend with a warm winter (so far). 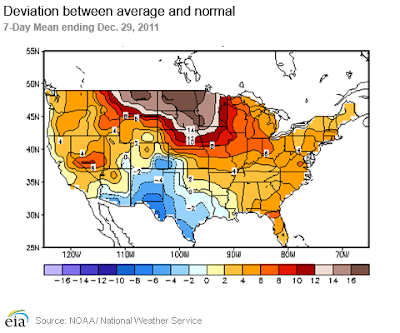 In the past couple of years, gas benefited from a cold winter, or at least a few weeks of brutal cold, but so far this year it's been pretty mild, as the temperature differential map below shows. 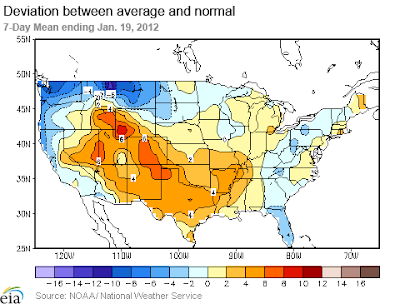 Last week's temperatures were 4.9 degrees warmer than the 30 year average and 6.0 degrees warmer than last year. Heating degree days were 15.3% below normal. Goodrich Petroleum announced its 2012 capital expenditure budget today with a total expected spend of $250 to $275 million. Unfortunately for gas fans, the vast majority of it will be spent chasing oil. Sound familiar? In the Haynesville Shale, $25 million will be spent to drill two wells in the Angelina River Trend area of Texas, and $35 million will be spent completing 14 (6 net) previously drilled non-operated wells. The rest of the budget will be spent int he Eagle Ford Shale ($155 million) and the Tuscaloosa Marine Shale ($20-$45 million), with the remaining $15 million spent on leasehold and infrastructure. Goodrich's total capex budget is $25-$50 million higher than last year, but the Haynesville portion is two-thirds of its $90 million 2011 capex budget. On the eve of the Republican caucuses in Iowa, the unthinkable happened. No, a rational political process for electing a president did not suddenly emerge. But another sacred cow bit the dust: the 30 year old federal tax credit for ethanol was not renewed by Congress in 2011 and it expired with the beginning of the new year. What makes this particularly unthinkable is that it happened in the midst of the Quadrennial Feast of Iowa (a.k.a. 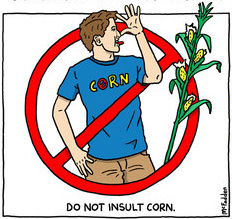 the Iowa caucuses), during which politicians normally kneel at the altar of all things corn. The difference this year is that corn is having a pretty good run and government subsidies are suddenly very unpopular. The ethanol subsidy made especially little sense. For 30 years, the federal government has offered a tax credit to turn food into fuel. It cost us $6 billion in 2011. But the feds also charge a tariff on foreign ethanol and mandate the use of ethanol in vehicle fuel. The tax credit was the cherry on top of a pretty sweet deal. The ethanol industry didn't fight too hard to keep the tax credits, which means that they have their eyes on a bigger prize, namely funding for fuel retailers to upgrade infrastructure to handle higher levels of ethanol, thus having the federal government subsidize the consumption of more ethanol. The corn industry doesn't think corn or ethanol production will be harmed by the loss of the subsidy, which makes me wish it had been taken off the table long ago. As long as mandates continue to exist, they are probably right.